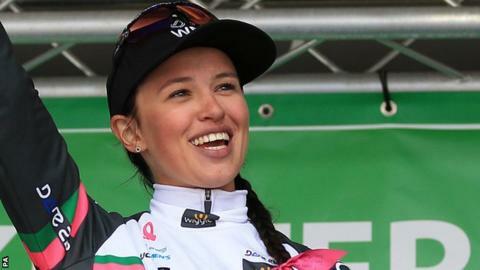 Poland's Katarzyna Niewiadoma claimed a solo victory on the opening stage of the Women's Tour in Northamptonshire. The 22-year-old broke clear with a little under 50km remaining to win by one minute, 42 seconds. Marianne Vos, winner of the inaugural Women's Tour in 2014, came second. Alice Barnes, 21, was the top British rider in seventh place. Britain's Lizzie Deignan, the 2016 winner, finished in 39th place, one minute and 50 seconds back. Dutch rider Vos won a sprint for the minor places at the end of the 147.5km stage from Daventry to Kettering. Thursday's stage two, 144km around Stoke-on-Trent, contains a number of testing climbs and should shape the general classification battle, before the sprinters can expect to have their chance in Leamington Spa on Friday. Saturday's stage is a circular route starting and finishing in Chesterfield, while the race concludes with a stage in London on Sunday.